WASHINGTON, D.C. – January 26, 2017 – It is now two and a half minutes to midnight. For the first time in the 70-year history of the Doomsday Clock, the Bulletin of the Atomic Scientists’ Science and Security Board has moved the hands of the iconic clock 30 seconds closer to midnight. In another first, the Board has decided to act, in part, based on the words of a single person: Donald Trump, the new President of the United States. 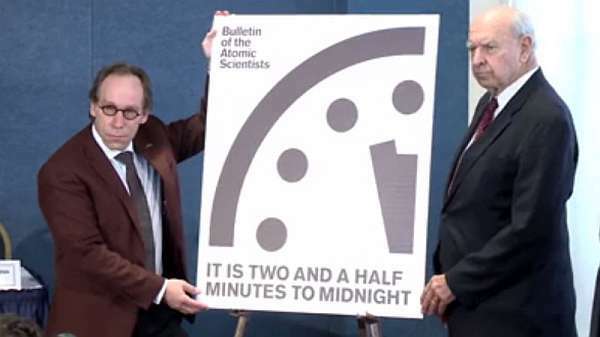 The decision to move the hands of the Doomsday Clock is made by the Science and Security Board of the Bulletin of the Atomic Scientists in consultation with the Bulletin’s Board of Sponsors, which includes 15 Nobel Laureates. The Science and Security Board’s full statement about the Clock is available online. 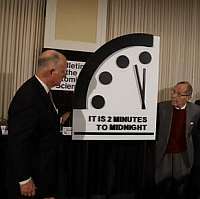 In January 2016, the Doomsday Clock’s minute hand did not change, remaining at three minutes before midnight. The Clock was changed in 2015 from five to three minutes to midnight, the closest it had been since the arms race of the 1980s. Retired Rear Admiral David Titley, Bulletin Science and Security Board; professor of practice, Pennsylvania State University Department of Meteorology, and founding director, Penn State’s Center for Solutions to Weather and Climate Risk, said: “Climate change should not be a partisan issue. The well-established physics of Earth’s carbon cycle is neither liberal nor conservative in character. The planet will continue to warm to ultimately dangerous levels so long as carbon dioxide continues to be pumped into the atmosphere— irrespective of political leadership. The current political situation in the United States is of particular concern. The Trump administration needs to state clearly and unequivocally that it accepts climate change, caused by human activity, as reality. No problem can be solved unless its existence is first recognized. There are no ‘alternative facts’ here”. Founded in 1945 by University of Chicago scientists who had helped develop the first atomic weapons in the Manhattan Project, the Bulletin of the Atomic Scientists created the Doomsday Clock two years later, using the imagery of apocalypse (midnight) and the contemporary idiom of nuclear explosion (countdown to zero) to convey threats to humanity and the planet.The decision to move (or to leave in place) the minute hand of the Doomsday Clock is made every year by the Bulletin’s Science and Security Board in consultation with its Board of Sponsors, which includes 15 Nobel laureates. The Clock has become a universally recognized indicator of the world’s vulnerability to catastrophe from nuclear weapons, climate change, and new technologies emerging in other domains.